I have a bright one for you today! I was in the mood for something seriously bright and contrasting so I immediately grabbed for my brand new bottle of Jindie Nails Candyland. I didn't want just a straight up swatch so I pulled out a contrasting black (Cult Nails Nevermore as usual) and my China Glaze Summer Neons and got to work. Below is the result. Want to see more? I thought so...click below to read more. How beautiful is Candyland?! I just wish the formula had been better as I found it a bit goopy and hard to work with. 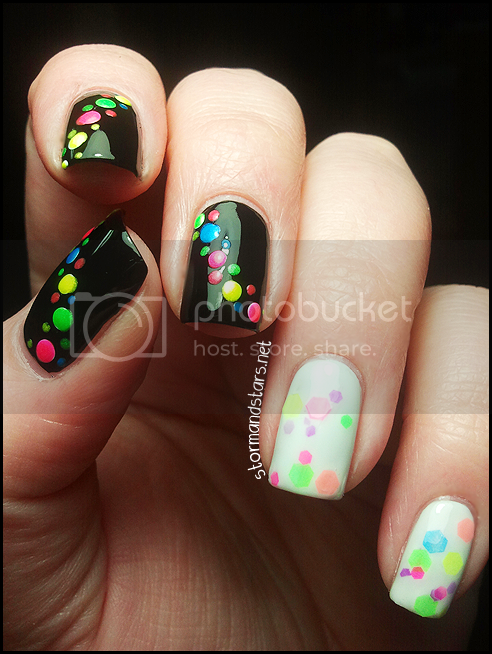 But, I'm loving the contrast between the neon glitter in the white base and the neon polkadots on the black. I wasn't sure about this mani when I did it, but now I'm really not sure what I was thinking, I might even recreate it, a little differently of course. 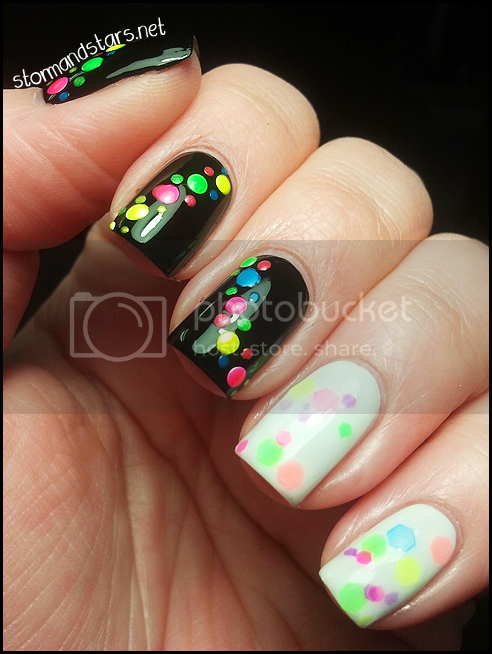 So what do you think of this neon manicure? Do you want Candyland as much as most people do? If you do, you might be able to get it. Jindie Nails is having a restock at their Etsy Store TODAY at 1:00PM Central Time! But move quick, cause it sells out fast! Cult Nails is 3-Free and can be purchased at their website for $10 a bottle. China Glaze can be purchase at varying prices at many retailers including Ulta and Sally Beauty stores. All polish in this post was purchase by me, with my own money. this is beautiful! I love the accent nails!